1MR vortex is the newest flagship pre workout produced by BPI Sports. Starting off as an alternative or derivative to the standard 1MR which has undergone several reformulations itself, 1MR Vortex has now replaced the original 1MR entirely. It’s important to note that 1MR and the new 1MR Vortex are not similar products except in their high level of intensity. Put them side by side, take them week for week, and you will see what we mean. They are both incredibly intense energy animals, but it’s a very different energy feel. You can see our ingredient comparison of 1MR vs 1MR Vortex here. The best description we can give to you for 1MR Vortex is that you are either going to love it, or not. This is a pre workout made for a very select group of people and not the masses. This group of people who will like 1MR vortex the most can be categorized as stimulant and focus lovers. And that is exactly what 1MR vortex caters to. Each tiny 3 gram serving of Vortex provides a very unique herb combination containing yohimbe, Indigofera pulchra, white leadwort, securinega, and straight caffeine that absolutely rushes the central nervous system. To specific users, this produces an incomparable mental intensity that is exactly what they crave to workout. But, for others it doesn’t quite sink in the same way. This is typically because the stimulant content is too high, as not everyone is as naturally tolerant or possess a self-mediated tolerance. Either way, you will not know until you try it, and that’s the route most guys take! 1MR Vortex is a stimulant loving bodybuilder’s pre workout as you can easily see. Whether or not this pre workout is for you, should also be becoming quite apparent. If 1MR is one of the first pre workouts you’ve heard of and you are trying to learn more – it may not be the best starting point. But, if you have tried all the rest and want nothing more than to take a pre workout that’s going to give you even more energy and focus than what you have already tried – you’ve found it. Yohimbe – Found to increase fat metabolism, acts as a stimulant, and can aid in expanding blood vessels. Yohimbe is occasionally used as a sexual vitality improving supplement. Many people do well with Yohimbe, but some do have adverse effects such as feeling frantic, sweaty palms, and not feeling good for an hour or two until it is metabolized. Indigofera pulchra – A stimulant potentiate, meaning it makes stimulants such as caffeine more powerful in the body. White leadwort – Like caffeine and other stimulants produces a higher level of focus via activity in the CNS. Securinega – An effective GABA receptor antagonist which effectively increases energy. Add caffeine on top of the mix with a little glycerol and you now have 1MR, one of the most stimulant-focused pre workouts made. After reviewing these ingredients it is without a doubt why this is such a powerful supplement. 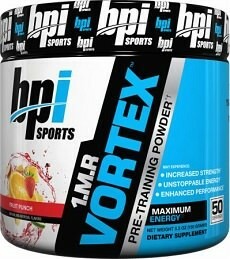 Overall, BPI 1MR Vortex is a great pre workout supplement for the stimulant lover. If all you want in a pre-workout is super-intense energy and focus, reach for the 1MR. If this is your first pre workout or you’re really not sure what 1MR is, then continue your research. We’ve laid out the information, and now it’s your time to decide. Leave your comments below!